How Remote Desktop Services let you run a Windows Hosted Desktop over the Internet on any device. Imagine your work PC with your usual business applications, documents and data on a shared network. Then imagine being able to take that PC anywhere in the world and continue to work with your applications and shared data, any time you choose. That’s the power of a Hosted Desktop. You can update your databases and change documents, all your changes are visible straight away by your colleagues back in the office. 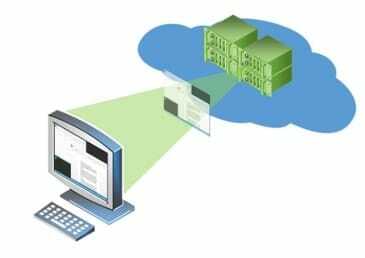 Hosted Desktops use a technology called Microsoft Remote Desktop Services, still commonly called Terminal Services. Everything runs on your own dedicated Windows server in our secure UK data centre. The only thing that travels down the internet is your keyboard and mouse presses. The only thing that travels back up is the image of the servers screen. Your applications are actually installed on the hosted server not on your PC. All you need on your computer or tablet is a small piece of software called a Microsoft Remote Desktop Client. This is available for PCs, Macs, iPads and Android tablets. Your server is what’s known as a Virtual Server running on a Hyper-V cluster. It benefits from the economies of scale of a large hosting environment to provide high performance, reliability and resilience at low monthly rental prices. All the data is also held in our data centre so it is physically close to the applications (like Office) you are running. This ensures great performance and reliability as well as security. At Your Office Anywhere we look after your server, making sure it is backed up, has latest Anti-Virus updates and Windows Updates, and fixing things if they go wrong. Why not visit our hosted desktop page to find out more about our services. Alternatively you can contact us or call us on 01282 500318 for a no obligation chat.